Apartment 2, The Granary01462 790210work01462 790210fax Self-cateringThis is a very spacious one bedroom apartment, with everything to an extremely high standard. Spectacular views of the harbour and salt marshes. Stairs & lift. Private parking. Close to the shops. No smoking or pets. Sleeps 2 adults. 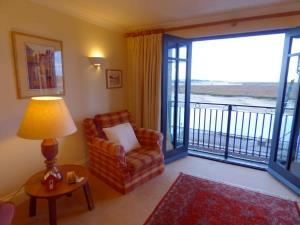 At every stage of the tide there is a different view from our stunning apartment on the first floor of The Granary. The long sandy beaches and pine woods are one mile away, either by car, foot or miniature railway. The main shopping street, Staithe Street, is literally around the corner. The bus service is about a quarter of a mile and around seven minutes walk. The apartment is accessed either by stairs or lift and is centrally heated. For disabled access please ring us. All rooms lead off a central hall, with a large bedroom with a super-kingsize bed, which can be separated to form twin beds. (with wonderfully comfortable Hypnos mattresses). The living room has large French windows looking out on an ever changing view of the harbour and salt marshes, with colour TV with Freeview, and DVD player and Wi Fi access. At the back of the living room, through an arch, is the dining area. The large bathroom has a bath with shower over. The modern, well-equipped kitchen has a washing machine/drier, dishwasher, fridge/freezer, microwave and Bosch oven/hob, and the view! Bed linen is supplied, and towels. Bookings are Friday to Friday with short breaks available out of peak season. We ask that you vacate by 10.30 am to allow for cleaning. The apartment will be ready for you to arrive by 3 pm. We provide a welcome with some fruit, homemade scones, local honey and some milk. Hoping you will have a really enjoyable stay in Wells-next-the-Sea. We look forward to hearing from you. CONTACT: John and Helen Ilsley, The Cottage by the Church, Weston, Hitchin, Herts. SG4 7DJ. This is a very spacious one bedroom apartment, with everything to an extremely high standard. Spectacular views of the harbour and salt marshes. Stairs & lift. Private parking. Close to the shops. No smoking or pets. Sleeps 2 adults. The Quay is well signposted from the A149 going through Wells next the Sea. The Granary is a prominent building identified with a gantry going over the road from The Quay.